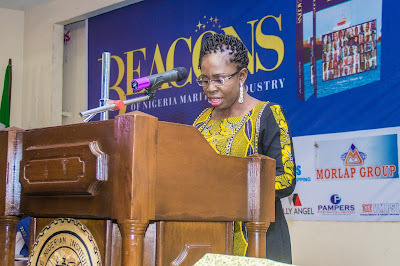 The book, Beacons of Nigeria Maritime Industry, which is being presented today, in part is designed to attract attention to the maritime industry; in a part, a biographical narration of 50 different personalities in a specialized industry. What is offered to us therefore, is a rich insight not just on their lives, but how they dealt with situations and survived the times. The authors, Hope Orivri and Obiajulu Agu, embarked on a purposeful journey to establish the fact that it takes an enduring process to build value, shaped by the things people do over time. Presented in a story form, the writers made the book an easy and interesting one to read, by telling each person’s story in segments – A well-crafted introduction, which gives the reader an overview of who a personality is and tells the reader to search for more. The other segments of each story – Fond Memories, Spectacular Experience, Career Path, and Early Life give the reader a full picture of a personality’s life in enjoyable doses. Interestingly, you can decide on what aspect of a person’s story you want to read now, and come back to, over and again! Photographs have been well used to tell parts of the stories; photographs of early life and more recent ones; some of them leave you giggling, and wonder how transformation happens as the years roll by. As it will be boring to do a summary of the 50 different personalities, what follows, gives a flavour and overview of the discourse. So, let me restate that the book presents 50 different personalities; and globally, people are drawn to reading biographies or autobiographies because they want to know what, why, and how notable people did the things they did. They want to know how people dealt with situations and survived the times; want to know what things informed different decisions that such people made, and how they handled failures and managed successes. Hence, anytime, a book about people – their backgrounds, early life and how they have been able to weather the storms and stabilize in a place, will make for interesting reading. On the whole, the contents of the book have mirrored life in its entirety; exposing the truth about life, that experiences will always be different for different people. But, the baseline is how people are able to piece the puzzles together and find meaning in what they decide to do. The stories tell us that there are no short cuts to success, rather, contents of the stories show long, enduring efforts and purpose to sustaining achievements. For reason of time, I will just take a few highlights from across the stories to represent different activities that add up to the collective value embedded in this book; some from tough experiences in early life, some on the career front, and some others, how providence and the circle they found themselves charted a path for them in life. A Marine Engineer recounts his strategy to passing an examination. …the crew prepared for the worst as water entered the vessel steadily. But, rather than sink after a while, the ship started stabilizing. Safe at a Port, they found a whale fitted in the gash on the bow where water had entered freely. When his vessel operated a five –year contract with zero down-time and zero loss-time injury in February 2015, this shipowner walked shoulder-high on this world record. When they operated for one year zero down-time, zero loss-time injury, the company celebrated the crew members at a ceremony graced by industry players. The trawler owners association take actions to back their trade…, once, they blocked the Lagos channel protesting that the Navy provides security on the waterways… again, they supported the building of a testing laboratory to guaranty quality fish for export… but, they still want one more thing! Conscripted into the Biafran Army as a boy soldier during the Nigerian Civil War when he was just 13 years old, he became a war detainee. He was considered a security threat after it was discovered that his father was still in Nigeria. She got a broader understanding of the maritime industry when she was made a registrar of ship in 1983. She became the first elected President of Women’s International Shipping and Trading Association (WISTA) in Nigeria, having become prominent through her public service activities in the industry. He started his working career in his father’s company as an indenting clerk. The position afforded him the exposure and knowledge of cargo clearing at the ports. Subsequently, he got interested in shipping and put in for a shipping bid, which his company won. His second time on River Andoni, he was the chief officer. The captain was a Ghanaian, there was a Kenyan, a Gambian, a Malaysian, which made them nick-named the ship United Nations. The company built 19 ships; 11 in South Korea, 8 ships in Yugoslavia, present day Croatia. From the 40 candidates selected after an aptitude test, he emerged among the final eight; four engineer cadets, four marine cadets, who passed the interview at the ministry of transport. That was how he started a life-time career in seamanship. But, it was a sad one for him the first time he got back from sea only to find that his mother had passed on shortly before his arrival. In the course of his work with the Navy, he was listed among those to go for a foreign training, but that plan suffered a twist. One of his close relatives working at the navy replaced his name with that of a girlfriend’s brother and, instead, sent him to the war front. After studying at the Britannia Royal Naval College, he had sea-time in a fleet, where he was able to travel across countries world-wide. Serving on board the HMS Rothesay, a frigate, this Nigerian was the only non-British of the about 350 crew on the ship. When he turned down an offer to work with the Airforce as an airplane mechanic, the other option was to go to the navy for training, even though it was a tough one. But, a great memory of watching his father work with machines and helping to carry his tool box remained with him. Both brothers quickly retrieved the eggs from the fire, put out the fire, and went to a safe place to have a feast of roasted eggs; a couple quite burnt, a number partly-cooked, and others that were raw. They enjoyed the luxurious meal and drinks, and by the next day, they spent the shillings like big boys would. Taking time to read through this book, Beacons of Nigeria Maritime Industry, I like the fact that the writers of the book focused on people who stand tall in a specialized industry. Taking together, they constitute an inspiring testament dedicated to men of excellence who are upstanding, not grand standing and wear the garb of distinction. Like any good book however, the book is not without weaknesses. For example, is it possible to have a more rounded picture of the 50 personalities than what is presented to us here? In other words, how do their strengths balance up and outweigh their weaknesses, which make even the greatest of men, mortals? In this reviewer’s opinion, iconic personalities such as we are dealing with in the Beacons of Nigeria Maritime Industry, do not necessarily preclude mention of failings. Notwithstanding these suggestions, an outstanding merit of this book, is its ability for piecing together into one book, semi-biographies of 50 different personalities. It gives the book a remarkable credibility, and makes it a resource to teach young people about life from diverse perspectives, and in a form that they can never be bored with –story-telling. So, I am pleased to announce that this is a book of great merit and worth. It deserves a conspicuous place in any decent library. For a close, get a copy of the book for yourself, and another copy for a young person who needs encouragement to remain determined for success. You will be glad you did.